I have listed a new property at 3305 KIDD CLOSE SW in Edmonton. PARKWOOD MASTER BUILDER offers this STUNNING 2044 Sq ft 2 Storey, CORNER LOT in the EXCLUSIVE community of Keswick just off Edmonton's Majestic North Saskatchewan River Valley Park System. This 3 bedroom Show Home offers numerous up grades like Granite, Hardwood, Vaulted ceilings, 2nd Floor Laundry, Oversized Garage. The Chef in you will love the kitchen with its MASSIVE island and eating bar, ample cabinetry and walk through pantry. The master bedroom has a HUGE walk in closet with custom wood shelving and a 5pc ensuite that feels like you have just walked into a LUXURY spa with its air jetted tub and separate glass enclosed shower. A large bonus/media room on the upper level makes for a great movie or games night with the family. Celebrate New Year in grand style! As the holidays are bursting of school concerts, parties, visits to Santa and shopping trips to the mall, it is also festive. However, if your home is on the market this time of the year you can know the spirited buyers out there are serious. Seeing your home decked out for the holidays just might make them want to ring in the New Year there as their own home. Pure and Simple. Adding reindeer and snowmen figurines to an already cluttered home, will not transform it to inviting. Before you start to add festive cheer, be sure to stage and clean your home first. A Few of My Favorite Things. The pillars of home-staging might tempt you to avoid the adornment, but a few hints of the holidays like a fresh evergreen wreath, a vase filled with ornaments and pinecones and a candy cane or cinnamon scent diffused through the home can create a warm and festive feeling. Don’t forget to add carols playing softly in the background. Silent Night. Remember more is not always merrier when it comes to Christmas lights. Tone down any over the top displays and instead use simple string lighting or a few sparkling LED spotlights to draw attention to your home’s landscaping or architecture. Happy Holidays. Opt for neutral winter and holiday decorations rather than items with religious themes. You want to attract any type of buyer and not risk causing offence. Oh Christmas Tree. A well-decorated tree can help you show off your home, but make sure it doesn’t overwhelm by taking up too much floor space. Resist the urge to hang the homemade kid’s ornaments and everything you own on the tree. Have a color-coordinated theme such as blue and silver or red and gold. Deck the Halls. Before you start untangling your tinsel, make sure your holiday collection matches your current decor. If your living room is platinum or blue, skip the clashing red and opt for white and silver candles, wreaths or snowflakes. If you’ve got an earthy color scheme, accent with rich tones and natural accents like cranberries and holly, forest greens and gold ribbons and bows. Comfort and Joy. A few decorations can stir the holiday spirit, but don’t go overboard. Adornments that are too large, crowded or bright can distract buyers from the home itself. The accents should make the buyers want to curl up with a cup of cocoa and stay awhile, not feel like they are looking at a store display. Limit yourself to a few splashes of the season’s spirit and keep the rest packed away for now. If you start to feel nostalgic for all your personal holiday items collected over the years, just remember with a little luck, next year you will be decorating your new home any way you please! 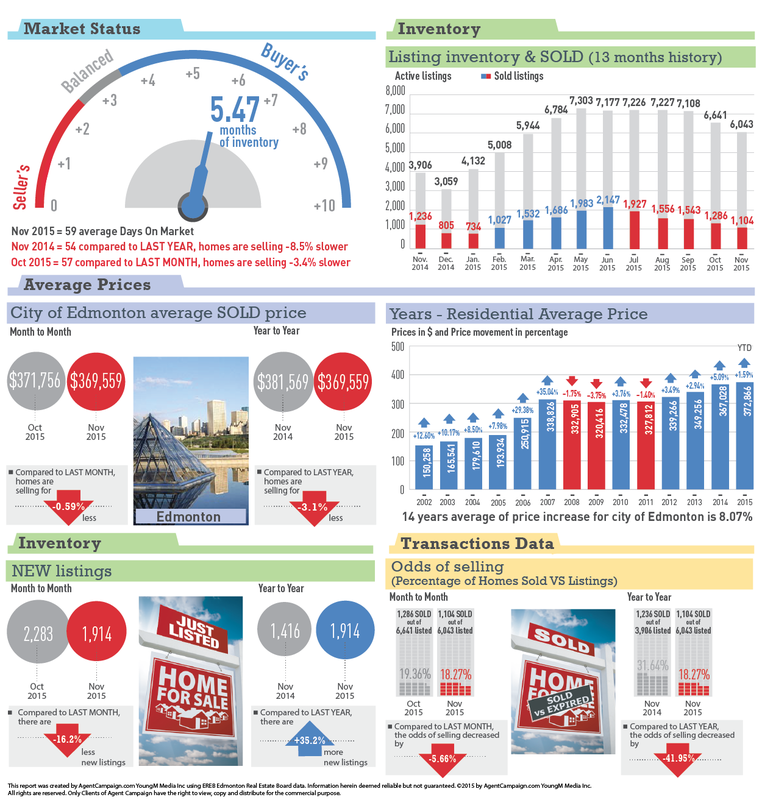 Edmonton, December 2, 2015: Edmonton’s housing market saw strong sales numbers in November. November’s all residential reported sales were down only 2.9% year-over-year (YoY), a notable improvement compared to October 2015 numbers which saw a 15% drop compared to October 2014. The average residential sales price in November for the Edmonton Census Metropolitan Area (CMA) dipped slightly by 3.1% YoY, however average year-to-date prices in November 2015 remain strong year-to-date (YTD) and are up 1.5% compared to November 2014 YTD.